Cat and Clean cat litter is a premium clumping cat litter, made from bentonite clay. It is around three times more economical in use than standard litters and has a pleasant vanilla fragrance. It is highly absorbent and the soiled litter rapidly forms into solid, flat clumps which are quick and easy to remove so it is not neceΒary to renew the entire contents of the litter tray. The cat litter is 99% dust free, making it ideal for cats with allergies, and does not stick to your cat's paws, thanks to the granules and fine consistency. It absorbs up to 380% of its own weight and locks in nasty odours. There are no chemical dust absorbers in this litter, which has an antibacterial effect. 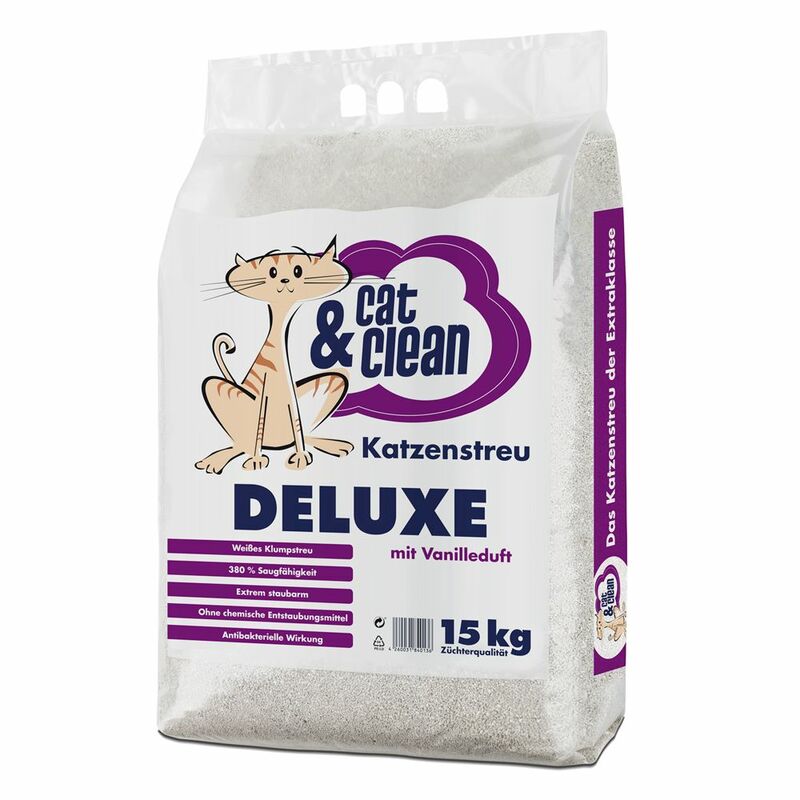 Cat and Clean de Luxe with Vanilla Fragrance cat litter at a glance: Clumping litter made from 100% small grains of bentonite clay 380% absorption to lock in even more nasty odours Doesn't stick to your cat's paws 99% dust-free, so ideal for allergy sufferers Develops a pleasant vanilla scent when damp Clump forming so very cost effective Approximately 3 times more economical compared to traditional litter Bentonite clay is a natural product Clean, natural cat hygiene Antibacterial effects Not bleached Fine granules.